Jordan Carlisle was Templepatrick's stand-in skipper against Woodvale. Having sent Woodvale crashing out of the Ulster Bank Challenge Cup with eight wickets to spare a few weeks ago, Templepatrick travelled to north Belfast confident of collecting the Senior League Section 1 points, but they returned home empty-handed. With skipper Robert Smith unavailable, Jordan Carlisle was in charge and when he lost the toss Woodvale decided to bat. However, thanks to fine economical bowling, they were bowled out for 181 in 45 overs, but this proved to be too much for the Templepatrick lads who managed only 133 in reply. Michael Stewart (3 for 24) and Chris Busby (3 for 18) returned the best bowling figures. 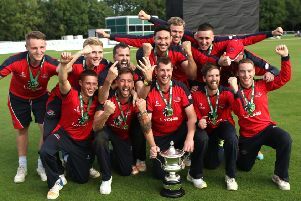 Phil Kernohan, Ross Bryans and Bob Homani each had one success, while stand-in skipper Carlisle was responsible for the run-out with an accurate return from the boundary to wicket-keeper Ricky Greer. In reply, overseas player Homani top-scored with 38, followed by James Jackson with 26. But they received little support, especially against S Kalbhor, who had the best figures of the afternoon, taking four wickets for 21 runs, en route to a win by 48 runs. Carlisle said: “Woodvale started promisingly but we pegged them back by taking wickets regularly and they failed to bat out their allotted 50 overs. Our fielding was quite good with Homani taking a spectacular one-handed catch in the covers. Woodvale won by 48 runs.